Takuma Sato’s slogan is “No Fight, No Chance,” but after Sunday’s horrific crash at the Houston Grand Prix, will he re-evaluate his tactics. The crash on the final lap involved Sato and three-time Indy 500 winner Dario Franchitti. The mishap launched Franchitti’s car up into the course’s crash catch fencing and the badly damaged car fell back onto the track. Thirteen spectators were injured when debris flew into the crowd and Franchitti sustained a concussion, spinal fracture and fractured right ankle. Another driver caught up in the accident was E.J. Viso. Sato and Viso were examined and released. Two of the injured fans were taken to Memorial Hermann Texas Medical Center but do not appear to be in serious condition, according to a hospital spokesman. In one of the final laps Sunday, Franchitti’s car made contact with Sato’s Honda. Sato said later that he had clipped a wall and slowed before the collision. Sato became the first and only Japanese driver to win an IndyCar race when he captured the Toyota Grand Prix of Long Beach in April. The Tokyo native will attempt another win, a possible two-for-two in Southern California, when he returns to Fontana for the MAVTV American Real 500 at the Auto Club Speedway on Oct. 19. Proving that his victory at Long Beach was not a fluke, two weeks later, Sato led until the final turn of the last lap of the Sao Paulo Indy 300 in Brazil, finishing second after being passed by James Hinchcliffe. By midseason, his race performances were plagued with mechanical failures, contact on the track, and a five-race probation for an avoidable contact with Ryan Hunter-Reay when entering the pit lane at Pocono. The probation ended after the Baltimore race on Sept. 1. At the Auto Club Speedway in Fontana on Sept. 24, team owner and four-time Indy 500 winner racing legend A.J. Foyt was trackside for the first time after surgery that kept him from being in Long Beach to witness Sato’s first IndyCar victory for his team. Foyt said his son and team director, Larry Foyt, has done a great job of keeping the talented Sato calm and operating within his limits. Sato in turn said he was very pleased to have Foyt back at the track. Sato also praised Larry Foyt for a tremendous job running the show, and said that he feels a responsibility to perform accordingly. 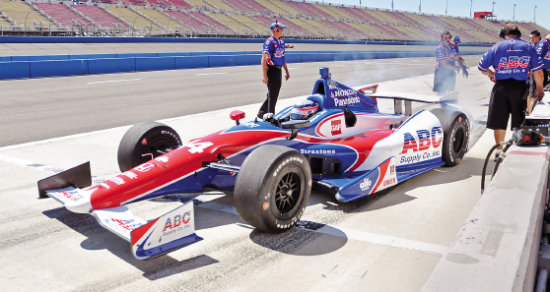 Sato’s car is the ABC Supply Co.’s Honda-powered Dallara, painted in red, white and blue and bearing the same number 14 used by A.J. Foyt when he raced at Indianapolis. Asked about a possible second career win at Fontana, Sato beamed, “That would be great news! I really enjoyed the first time coming here last year and seriously found a very tricky track. I wasn’t sure how I can go flat-out all the way on the test day, but we all qualified and the race was very interesting. Sato said last year at Fontana was very exciting, and he’s hoping to be just as competitive on Oct. 19. He also acknowledged the large fan base of people from Japan on the West Coast. Tuesday, Sept. 24 was testing day at the Auto Club Speedway. In stark contrast to a race day, with packed grandstands and pit crews wearing their fire-retardant safety suits and helmets, the session had single cars zooming past empty stands and crew members wearing shorts and sneakers, not trying to beat the stopwatch to get the car out of the pits, but to get the lap speeds faster. The testing was mainly to analyze the performance of the racing engines, made by Chevrolet and Honda, that power the Dallara Indy race car, and to get an idea on how to set them up to get optimum speed. Slight adjustments to the stiffness of the suspension or minute angle changes of the front and rear wings, slight differences in tire pressure, harder or softer tire compounds all affect whether the car will grip better in a turn, allowing the car to get a better line to help with speed and enable the driver to pass another car. Sato is returning to the Auto Club Speedway for his second time racing this course. Asked how much difference there is compared to last year, he mentioned that last year he didn’t know what to expect going into the race and major changes were made on the initial settings on the car. The race was also run at night and the lower temperatures made the overall performance and handling of the car different. The experience gave him a feeling of what to expect this time around, plus the team is the same, so a basis has been established on how to set up the car. “The runs had progressively become better and I was pleased on how the car performed,” Sato said after the afternoon session, adding that the team has the car about two-thirds of the way to their performance goal. “The race is still a few weeks away and there will be changes in the track surface. Being a night race, and if the wind direction varies, that drastically changes things,” he explained. “By testing various settings, we open our drawer to see what works. Sato explained that the surface condition of the track changes and also the amount of air down force is different. Sato’s plan of attack is to get good position on the first lap. The race is long, so the objective is to move up in position a little at a time. Sato said each type of track has its challenges, but added, “Here at the Auto Club Speedway, it’s a very exciting track. The race is thrilling and it’s hard to know who’s going to win until the end. Unlike racing single file, you’re able to run side by side, which makes it more difficult to win. Before joining IndyCar, Sato raced in Formula 3, then Formula 1. He was close to victory last year, leading for the last 20 to 30 laps. In Sato’s win at the Grand Prix of Long Beach last year, the pit crew’s teamwork was a major factor. Asked about his plans of returning to Indycar next year, Sato said he wasn’t in a position to comment but has been talking with the team and would like to come back. He is currently 16th in points, with one race to go for the IndyCar Championship. 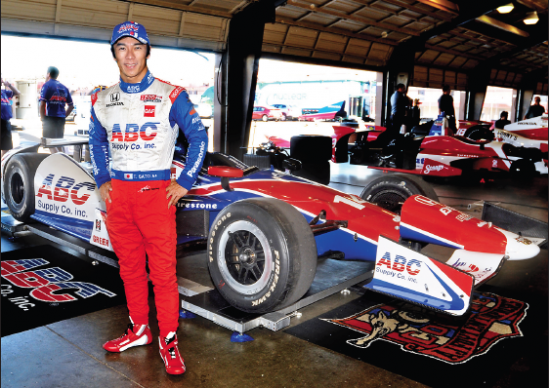 A Takuma Sato ticket package is available for Oct. 19. A grandstand ticket, pit/paddock pass, question-and-answer session with Sato, souvenir cheering flag and free parking are included for $35. Call (800) 944-7223 or visit www.autoclubspeedway.com/SATO for information.